The current fight for Yemen’s future comes at a very high price for its citizens. Yemenis are suffering loss of life, loss of their homes and possessions, and a systematic loss and destruction of their rich and unique heritage. The protection of human life takes first priority in times of conflict, but the loss of Yemen’s culture and history is far from collateral damage. It is an irreplaceable resource, integral to Yemenis and part of the story we all share. 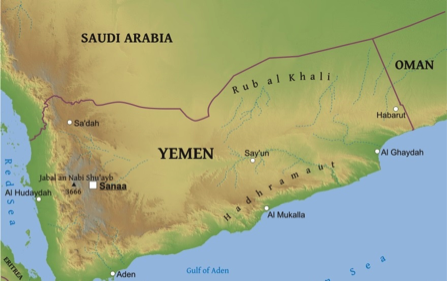 And the fate of Yemen’s sites, objects, landscapes, and folkways are under threat caused by all out civil war. Yemen is a country with a rich heritage and background. Called Arabia Felix or Arabia Eudaimon by the Romans and Greeks, (that’s Happy Arabia in English), the flourishing cities of South Arabia are mentioned several times in the Bible Today the area is mainly known as the legendary land of the Queen of Sheba, known locally as Bilqis, and her capital at Marib. In the 1st millennium BCE, South Arabia became home to four major kingdoms (Saba, Ma’in, Hadramaut, and the Qataban). Most of these kingdoms were involved in the trade of incense and other spices, leading to legendary wealth. Archaeological fieldwork uncovered traces of much older civilizations as well. The province of Marib northwest of Yemen’s capital Sanaa has a multitude of sites including the ancient city of Sirwah, but also other imposing temples, mosques and residential buildings. The great dam, al ‘Arem, is an engineering masterpiece, and is featured on local currency as a sign of construction and prosperity. Construction of the first Marib dam began around 750 BCE. In later times, the dam height was increased to 45 feet with walls of 25 feet. The dam was designed to divert water into channels, which allowed the irrigation of 25,000 acres. Yemeni heritage professionals, with contributions from German colleagues, have long collaborated in the preservation of sites in the Marib region. Yemen’s magnificent cultural and natural patrimony includes entire villages, a large number of museums, mausoleums, castles, churches, mosques, libraries, parks, and both land and underwater heritage sites. Entire camel cemeteries from the first millennium BCE have been identified. There is an extremely wide array of sites and intangible and tangible heritage traditions in Yemen and the islands in the Red Sea and the Indian Ocean (Socotra). By 2014, Yemen had four UNESCO World Heritage sites, while ten more sites and regions have been on the tentative list since 2002. South Arabian architects and artists produced extraordinary temple architectures, bronze-work and alabaster statues. There are exceptional collections of manuscripts and Korans kept in museums and libraries, information on some of which has been compiled in the recent international collaborative Yemeni Manuscript Digitization Initiative (YMDI), and by European colleagues working in collaboration with Yemeni colleagues. During civil unrest in 1994, entire museums were emptied, showcases were broken and materials looted from Lahej/Hawta, Habilayn and the Wadi Beihan. Thousands of inscriptions, alabaster statues from graveyards and cemeteries, and manuscripts were sold into the black market by cultural racketeers. A new heritage crisis developed after the toppling of Ali Abdullah Saleh, during the Arab Spring. A transitional period began in 2011 when citizens, particularly young people, protested on the streets against corruption and traditional political parties. In April 2012, Abdullah Awbal, then Yemeni Minister for Culture reported on looting and the illegal sales of cultural materials. Concerned officials have repeatedly stated that the country’s heritage is at risk of looting from specialized and highly trained groups, focused particularly on manuscripts and antiquities that can be easily moved. Limited local and international support and funding leads to a lack of security in some of the regional museums, as well as key heritage sites. Many archaeological sites, especially prehistoric cemeteries, remain undiscovered or improperly documented, and are thus vulnerable. Losing more of the ornate sculptures that once adorned the sanctuaries and tomb complexes to further looting and trafficking would do irreparable harm to the future of South Arabia and to the loss of our common heritage. Interest in Yemeni antiquities and materials is in part due to the association of sites or personalities with biblical stories and Islamic traditions. The devastation of Yemen’s cultural heritage caused by the illicit trade in antiquities is among the most severe in the Arab-speaking world. Citizens driven by poverty and the interests of rich collectors destroy Yemen’s most valuable non-renewable resource. With the advent of new conflict, Yemen’s cultural heritage is in grave danger. The combined crisis of a lack of security for heritage, a crippling economic situation and a battle for control of the country puts this region’s rich and unique history at severe risk. It is unfortunately following in the footsteps of other regions in the Middle East, including Iraq and Syria, where their precious heritage is being sold to the highest bidders in international markets. It is time for leaders in the region — and the international community — to come together protect Yemeni heritage in this time of crisis.